Ever since returning from our Spring Break trip to Horseshoe Canyon Ranch in March – we have been on the go, with what has felt like, barely a moment to spare. A few days after horse riding, rock climbing, zip lining and eating LOTS of amazing food, my husband and I left for Washington DC – as president of the Arkansas Hospitality Association he had a conference to attend and meetings planned with our state senator and congressmen. Following four days in the Capitol, it was home to parent-teacher conferences, birthday parties (both kid and adult – necessitating gift buying and appetizer making), happy hours, a Shrimp boil, and getting organized for family photos (which was no small feat and more time consuming than I would have ever imagined – spray tan, facial, teeth whitening, hair appointment and professional make-up, while ensuring the parts of the house to be permanently captured on film were clean and tidy), as well as attending to all the regular activities, daily tasks and volunteer endeavors for our family of five. Then, after organizing a pizza donation, a wedding anniversary, a dinner party to celebrate 25 years in business, and readying our home for an evening with a group of incredible chefs, followed closely by 3 family friends from New Zealand coming to visit for a couple of nights on their 6-week road trip across the States – it was wonderful to enjoy a quiet, relaxing Easter with our family – and to have left overs for a simple, wholesome meal the next day. Put the quinoa in a mixing bowl, add eggs, cheese, sour cream, herbs de provence, garlic and Dijon mustard. Mix in the greens and ham. Heat olive oil in a large frying pan, saute onions until they start to caramelize, add mushrooms and saute for a few minutes. Add onion mixture to egg mixture, stir to combine. Pour into a well greased dish, bake for 25 to 30 minutes, or until set. Top with shredded parmesan. Allow to cool for 5 minutes before cutting to serve. I have been experiencing chronic tightness and soreness along the right side of my neck and in my right shoulder. I have visited a chiropractor and massage therapist, taken yoga and pilates classes, and had get-togethers with friends that are always full of therapeutic laughter, conversation and occasionally even a glass or two of wine – all of which have been part of my ‘therapy’ for a while. However, I have always been intrigued by acupuncture, and when it was suggested I try that, I wasted no time in making an appointment to see if it would hasten the healing. 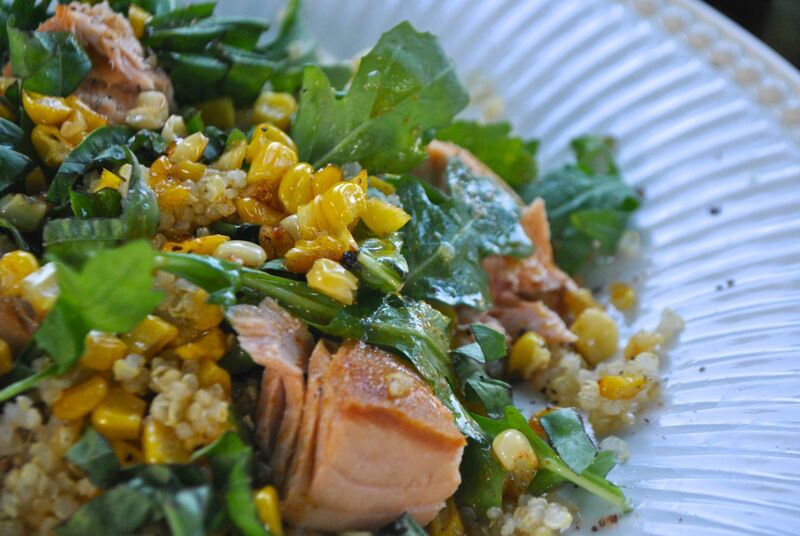 This Quinoa and Salmon Salad with Arugula, requires no beating, kneading or mixing, and therefore places no stress or strain on my upper body, and it also fits perfectly into my usually healthy, occasionally balanced lifestyle. In a large mixing bowl, whisk together all of the dressing ingredients. Add in the quinoa, arugula, corn and basil. Add the salmon. Gently toss the mixture in the dressing, season with salt. Taste and add more salt if desired. Lovely, healthy side salads – perfect for the seasonal transition. Cook the edamame according to package directions. Drain and cool. 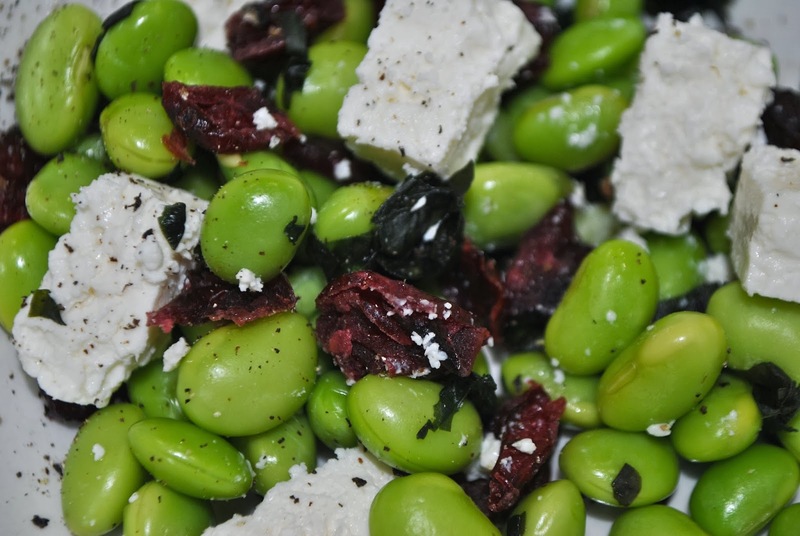 Place the cooled edamame in a bowl, add cranberries, feta cheese, basil, olive oil and pepper. Gently stir to combine. Serve chilled. Cook the quinoa in water for 15 to 20 minutes. 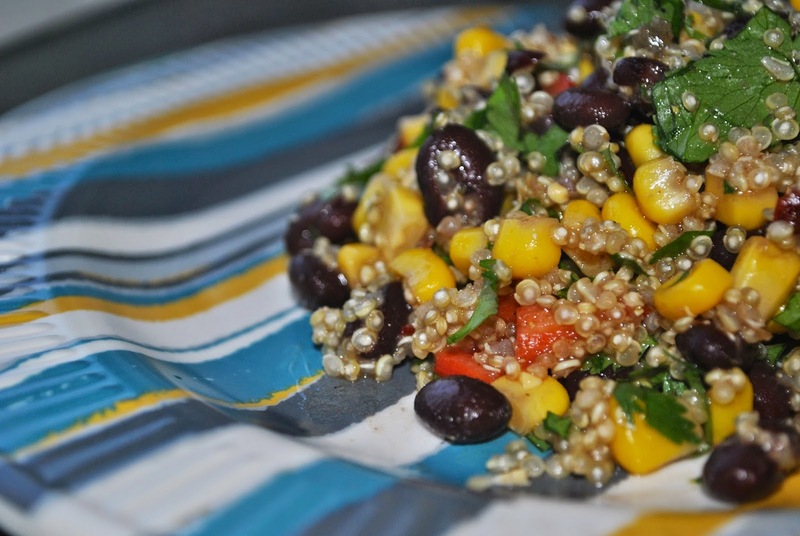 Mix the quinoa, black beans, corn, red pepper, jalapeño, green onion and cilantro in a large bowl. Mix the olive oil, lime juice, chipotle, cumin, coriander, hot sauce and salt and pepper in a small bowl. Toss the salad in the dressing. Cook lima beans in a pot of boiling water, until heated through, about 5 minutes. Drain the beans, place in a bowl. Cook the spinach in boiling, salted water until cooked through. Cool until manageable, then squeeze the spinach to remove any excess water. Combine the spinach, walnuts, garlic, vinegar and olive oil in a food processor and process until smooth. 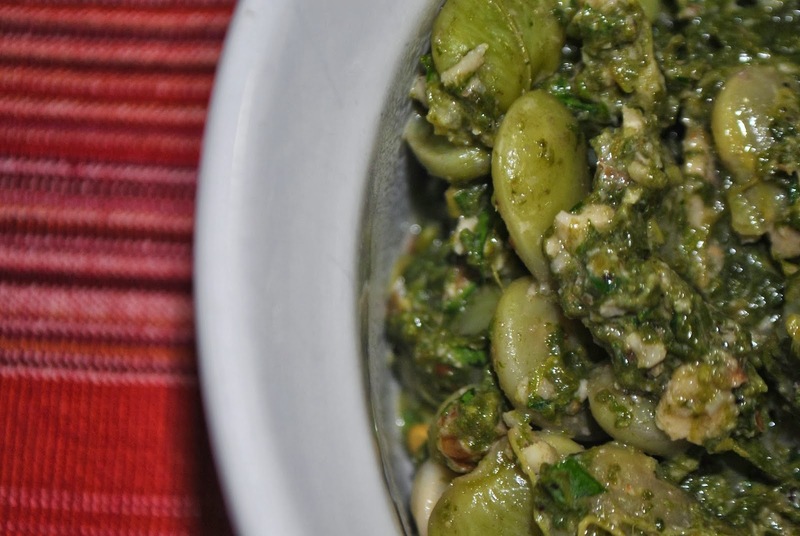 Gently stir the spinach mixture into the beans along with the parsley, coriander, and dried red pepper flakes. Season with lemon juice, salt and pepper. Cover and refrigerate for 1 hour before serving. I LOVE beets! They are one of those ingredients that draws me in, and influences me to try a recipe. I grew up only knowing pickled beetroot, which we would put on a burger or sandwich, so my discovery of fresh beets during the past few years has been a delicious and beautiful revelation. Combine vinegar, lemon juice and shallot in a small bowl. Stir in mustard. Gradually whisk in oil. Season to taste with salt and pepper. Toss beets with oil in a large bowl. Season with salt and pepper. Transfer to a baking dish, cover tightly with foil and roast beets until tender, about 40 minutes. Uncover, let stand until cool enough to handle, about 10 minutes. Peel beets, then quarter them. Toss beets with 1/4 cup vinaigrette in a medium bowl. Arrange burrata on a serving plate. Season with salt and pepper. Top burrata with beets, drizzle remaining vinaigrette from bowl over the top. 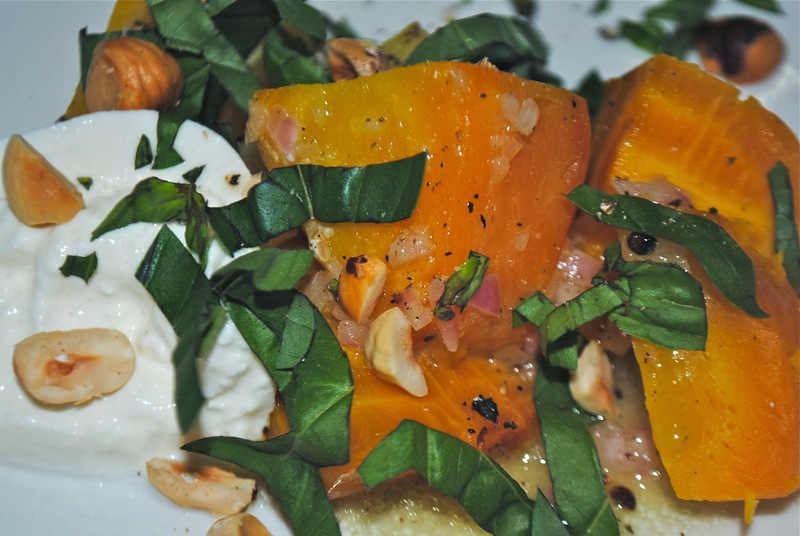 Garnish with basil and hazelnuts. In a bowl, whisk the lemon zest and juice, shallot and olive oil, season to taste with salt and pepper. In a large bowl, toss the remaining ingredients with the dressing. In a baking dish, toss the beets with the oil. Cover with foil and roast for about 1 hour, until the beets are tender when pierced. Let cool slightly, then peel the beets and cut them into small wedges. In a large skillet, heat 2 tablespoons of the goat butter. 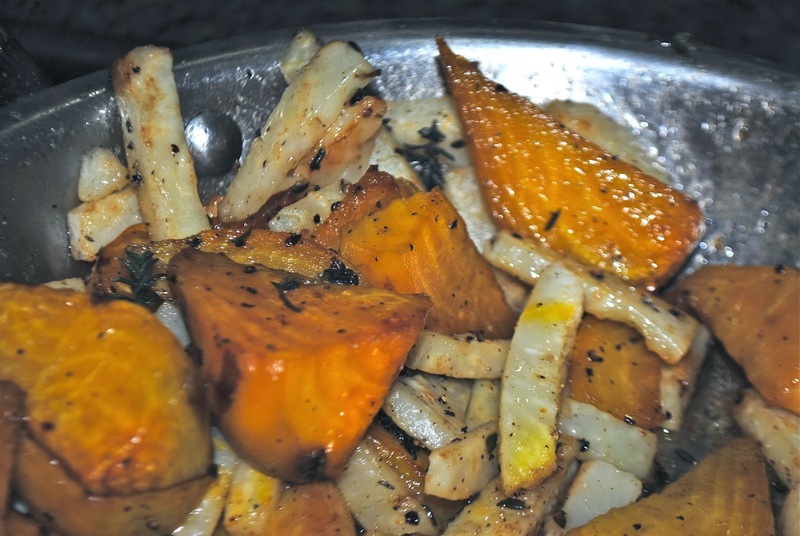 Add the celery root and thyme sprigs and season lightly with salt and pepper. Cook over moderate heat, stirring occasionally, until lightly browned in spots, about 5 minutes. Add 1/4 cup of the stock and simmer over moderate heat until nearly evaporated, about 2 minutes. Add the remaining stock, 1/4 cup at a time, and cook until the celery root is tender, 8 to 10 minutes total. Stir in the beets and cook until heated through, about 2 minutes. Discard the thyme sprigs. Swirl in the remaining 1 tablespoon of goat butter and season with salt and pepper. I find such joy and satisfaction in putting a simple meal on the table for my family and returning to familiar household routines after being away from them. I adore travel – the excitement of packing up and disappearing on an adventure – but I love to be home too. In a large pot, boil wine and 4 cups of water. Add salmon, onion and thyme. Reduce heat to simmer, poach salmon until cooked through, about 7 minutes. In another large pot, boil 4 cups of water. Add quinoa and cook until tender, about 11 minutes, drain. In a bowl, mix quinoa, chickpeas, raisins and spices, cool. 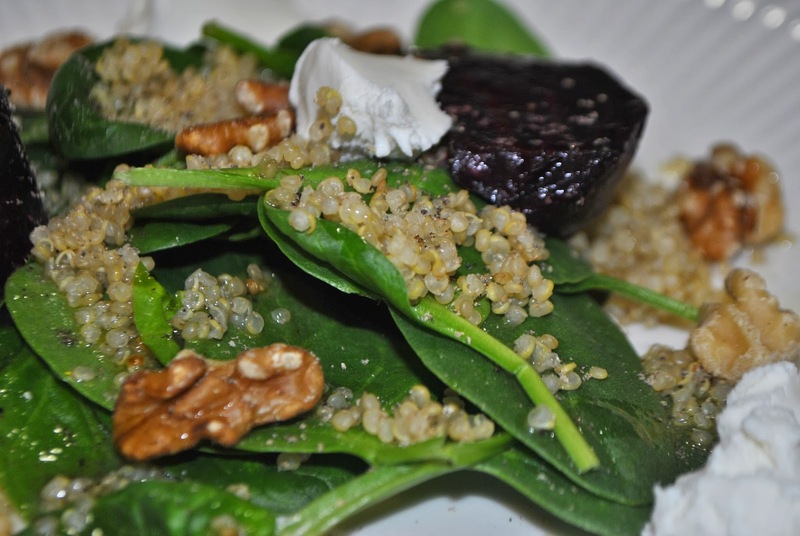 Toss quinoa mixture with arugula. Dress salad with lemon juice and oil. Season with salt and freshly ground black pepper. Divide salad and poached salmon among 4 plates. 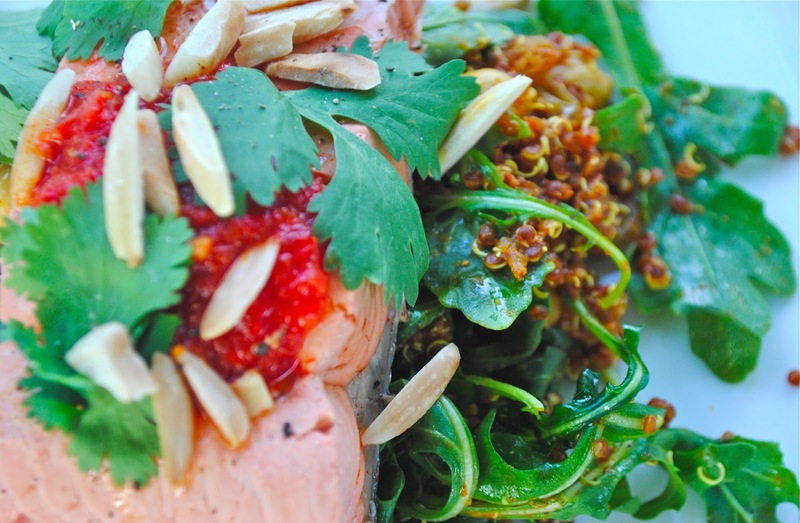 Top each salmon fillet with 1 tablespoon harissa. 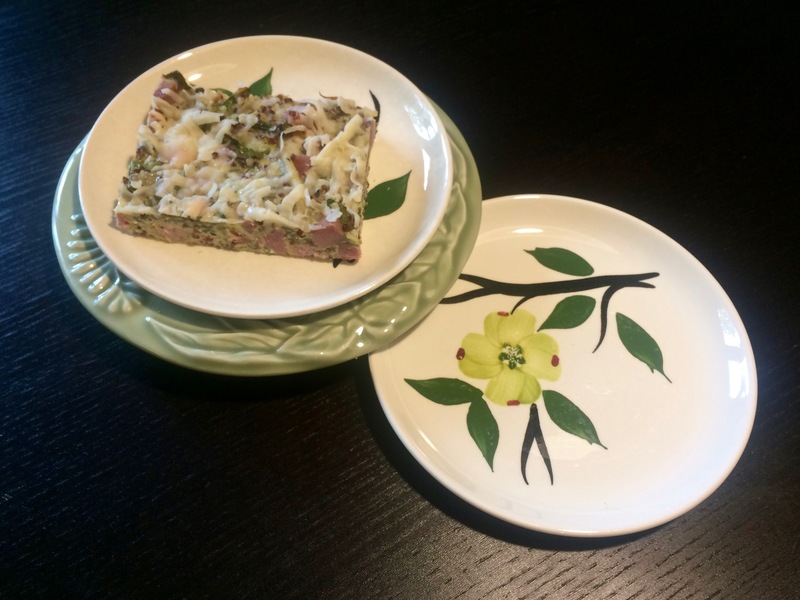 Garnish with cilantro and almonds.